Part of a midtown Manhattan block was evacuated and 57th Street was closed for hours Monday after a crane hauling up a load became stuck on the same building where a crane famously dangled after Hurricane Sandy last year. The tower crane at 157 West 57th Street became stuck, leaving its 13,000-pound concrete counterweight hanging up above, while it was being removed, officials and the construction management company said. The street was closed between Sixth and Seventh avenues, and the immediate area was evacuated as the load was slowly lowered. It reached the street at about 3:30 p.m., six hours after the initial malfunction, and the street was reopened. Con Ed said steam service was turned off to nine buildings in the area as a precaution. 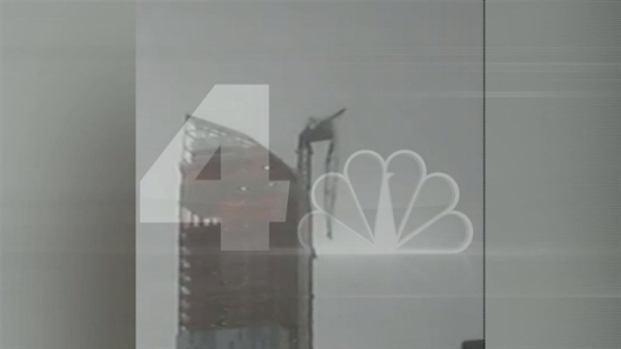 NBC 4 New York Exclusive: A crane on top of the luxury residential building at 157 57th Street between 6th and 7th avenues in Midtown collapses Monday evening. A crane hung from the same luxury residential building after it gave way amid Sandy's high winds last year. The block was shut down for a week. Officials said the hoisting equipment somehow failed and left the concrete counterweight hanging. The crane is owned by New York Crane and Equipment Corp., which also owned the crane that collapsed and killed two workers on the Upper East Side in 2008. The company had no comment Monday. Lend Lease, the construction management company for the building, apologized to the community "for the inconvenience."